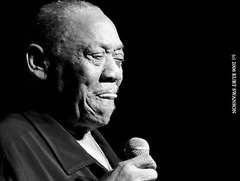 Yesterday, I learned that we had lost another Blues legend – the incomparable Bobby “Blue” Bland. Bobby was a true innovator, and was one of those who combined Blues and Gospel with R&B as it made its way onto the music scene. I can tell you, I’ll never approach performing Stormy Monday Blues in quite the same way. The same goes for Turn On Your Love Light – which, by the way, I had the honor of performing this past weekend. Join me, if you will, in a prayer for Bobby Blue Bland. May his light forever shine. You and David were a great addition to the PHP pro jam. I had a great time as did the crowd, It was popin’ last night, no dought!